Scientific American / Farrar, Straus and Giro, 9780374120405, 176pp. In Champions of Illusion, Susana Martinez-Conde and Stephen Macknik present a smorgasbord of mystifying images, many selected from their Best Illusion of the Year Contest. Whether it’s false motion, tricks of perspective, or shifting colors, Champions of Illusion is packed with adventures in visual perception. If you have ever found yourself face-to-face with an utterly bewildering illusion, you know the powerful effect such images have on the mind. The question we often ask ourselves is, How is that possible? Martinez-Conde and Macknik, who study the intersection of neuroscience, illusions, and stage magic, explain just why we think we see the things we see. The Best Illusion of the Year Contest draws entries from vision scientists, artists, magicians, and mathematicians bent on creating today’s most beguiling illusions. 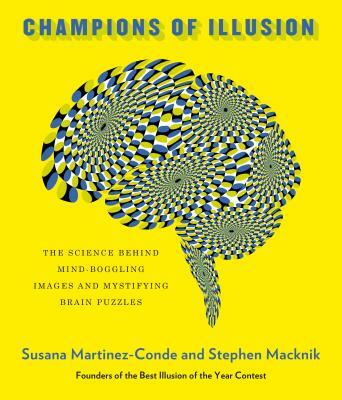 Featuring the contest’s most bizarre effects and unbelievable mind tricks, along with classic illusions and illuminating descriptions of what is actually going on in your brain when you are deceived by visuals on the page, Champions of Illusion is an electrifying mix of science and magic that you will not soon forget. Susana Martinez-Conde, Ph.D., is Director of the Laboratory of Visual Neuroscience at Barrow Neurological Institute. She is co-author of Sleights of Mind: What the Neuroscience of Magic Reveals about Our Everyday Deceptions. Stephen L. Macknik, Ph.D., is Director of the Laboratory of Behavioral Neurophysiology at the Barrow Neurological Institute in Phoenix, Arizona. He is co-author of Sleights of Mind.